Dustin Pedroia sat in the Red Sox dugout roughly four hours before last night’s game, already finished with early batting practice. A Red Sox coach walked down the steps and complimented him on his hitting session. 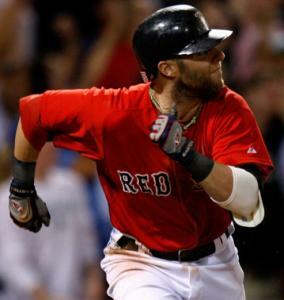 “I hit rockets,’’ Pedroia said. Some six hours later, Pedroia dug in to the batter’s box against Brian Bannister. The Fenway Park scoreboard had changed only for posterity’s sake since his batting practice, with Bannister and Jon Lester having traded zeros. After a wild pitch in the eighth inning, the first run of the game stood 90 feet away. On the third pitch of his at-bat, Pedroia hit another rocket. The ball caromed off the middle of the Green Monster, the thunderclaps off the bat and the Wall piercing the night. Pinch runner Aaron Bates bounced home, the only run in a 1-0 Sox victory over the Kansas City Royals. Pedroia sprinted to second, the 38,116 in attendance exploding as he popped up on the bag, clapped his hands, and pumped his fist. Pedroia’s hit ensured the Red Sox would keep a least a share of first place, and the Sox claimed sole possession when the Yankees lost, 10-6, in Anaheim, Calif. It also provided further evidence Pedroia could be recapturing the form that made him the American League MVP last season, even as his pregnant wife, Kelli, remains in the hospital and on his mind. It was around this time last season that Pedroia’s season took off. It’s happening again, his batting average improving 15 points, back to an even .300, in less than a week. Pedroia is 11 for 21 with two homers and five doubles in the five games he played since last Sunday, in three of which he mashed three hits. He only had one last night, but it meant more than any of the others. “He’s in the midst of trying to get real hot,’’ manager Terry Francona said. Lester faced the Royals for the first time since May 19, 2008, one of the greatest days of his life, the night he threw his no-hitter. Last night was not historic for Lester, merely one of the best pitching performances of the Red Sox season - he allowed four hits and no runs in eight innings. He did so wearing a new pair of black neon spikes, representing Livestrong to raise cancer awareness while Lance Armstrong races in the Tour de France. After he walked Alberto Callaspo to lead off the eighth, Lester recorded the first out by freezing Ryan Freel with a 95-miles-per-hour fastball at the knees on his 109th pitch. Two fly outs later and 115 pitches in the books, Lester was walking off to a standing ovation. The scene’s lone problem hung on the backdrop of Lester’s stroll, over his left shoulder: The Sox had not yet scored. A moment later, Kotsay stepped in. Bannister, who allowed his first hit in the fifth, had retired him twice with pitches outside that Kotsay rolled over for ground outs. “My approach had to change,’’ Kotsay said. He wanted a pitch up that he could hit to the opposite field. Bannister threw a changeup that stayed belt high, and Kotsay stayed back long enough to rope it through the middle for a single. Bates ran for Kotsay, whose calf is still sore. Francona called for a bunt. Green had tried several sacrifices this season, and each time he had failed. Green bunted the first two pitches foul. Francona took the bunt off, but “I’m kind of hard-headed sometimes,’’ Green said. He also wanted to ensure that a double play did not kill the inning, and, on an 0-and-2 count, Green laid down a clinical sacrifice. Bates scampered to second. J.D. Drew struck out, and up strode Pedroia. “We always feel like when he comes up in that situation, something good is going to happen,’’ Francona said. His teammates have grown used to seeing Pedroia arrive at the park early and leave late. He has condensed his schedule since Monday. Late last night, while most of his teammates changed into their street clothes, Pedroia’s locker was already empty. He had left to be with his wife in her hospital room, where he keeps a small bed.